A threatened bird, the chimney swift, only stops flying to land on vertical perches inside hollow trees, chimneys of old buildings, abandoned wells, grain silos, air shafts, barns, sheds and derelict houses. The population is threatened due to habitat loss. Interesting as so much of their habitat has adapted to live alongside people. There are many animals living in urban environments but I hadn’t heard of the chimney swifts before. Foraging 2.0: Grafting Fruit-Bearing Branches To Neutered City Trees: SFist. This is interesting to me because we gathered apples from abandoned farms and along the roadside from trees which were pretty forgotten. These apples would be heritage seeds and possibly types of apples no longer grown commercially. Yet they were often a stronger or better type of apple, resistant to bugs and disease. But unpopular for some other reason. The idea grafting branches never occurred to me. It would give you the chance to have apples much sooner than growing a new tree from seed. Also, a lot of trees grown from seed just don’t make it. Grafting would have a better chance for success, though need more time to keep the tree from going back to it’s roots, literally. This is an abandoned house in Scarborough. On Kingston Road, near Markham Road, as far as I remember. It was all painted red and white. I remember seeing this house before when it was something, I don’t remember what it was though: car lot, restaurant or something else. But it was red and white then too, many years ago. Now it is abandoned but the city is saving the trees on the property. More photos on the Ontario Rural Ruins blog. This house would have been one of those houses you can’t really see behind a tall hedge of thick pine trees. It had a ‘Private” sign in the front, along with the rabbits for sale. This house will be gone soon, all it’s pine trees have been taken down. It must have had a fire inside – I could see the scorch marks on an upstairs window. It is certainly not being lived in. Kind of like an abandoned bee hive. At Museum: On Charles W.
Taken from across the street. I thought I needed the distance to get in the whole building from top to bottom. The parked cars were in the way to see the bottom and the trees were pretty scraggly looking in the rest. Posted on March 22, 2007 November 7, 2017 Categories Urban ExplorationTags building, cars, toronto, trees, Urban ExplorationLeave a comment on At Museum: On Charles W.
Originally uploaded by Olly C.
Gives a less than glowing impression of Christmas doesn’t it? What does happen to all those real trees which are cut down and dumped out? I have a fake tree and I’m proud! abandoned Christmas trees. 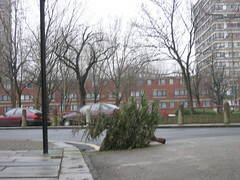 A Flickr group for Discarded Christmas Tree photos. My ex-husband has taken up photography. I really like this one with the little house hidden in the bushes and trees, along the road. Have a look, some of his photos are really good. He likes a little urban exploration and graveyard haunting too. OK, not all of them were on topic for urban exploration. I just like a lot of things. I don’t think I can really explain this one. I just like it.